Just a quick post now that the munchkin is gone off to bed to share my most recent stitching progress. I am now about 3/4 done with German Garden. I really like the bottom half of this piece. It has some neat specialty stitches. 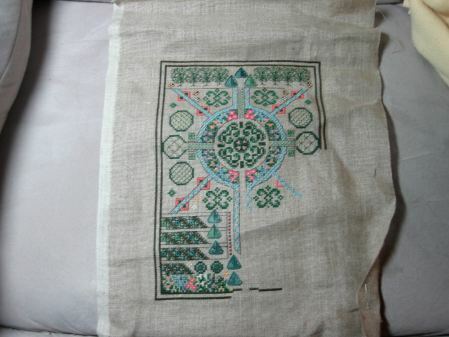 Over the weekend I spent some time working on Nathaniel’s birth sampler. I am now mostly done with bands 8-10. All that is left in those bands are the bees and ladybugs, but I think I am going to save all of them until last so I only have to pull out the detailed charts once. In other news, our cat Cooper is now Internet-famous. Allen got a great picture of him several weeks ago. He added a cute caption and submitted it to icanhascheezburger.com After several weeks of thinking that it wasn’t a cool enough picture, we went to the site and who was at the top of the page…Cooper. If you like cute cat/animal pictures, visit the site. As of today, Cooper’s Dramatic Cat picture has moved to page two, but check him out. I think the fame is going to his head though. He asked if we could call him an agent!!! « A Spot of Tea! Both of your WIPs are gorgeous Leslie! 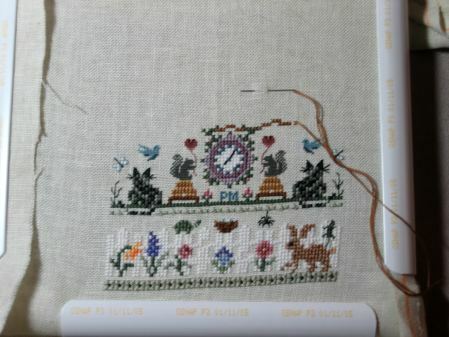 I just love the little squirrels by the clock on the baby sampler. Love the caption hubby thought of for the Cooper pic. Very cute. Your GG is just gorgeous…and your baby’s sampler…stunning…I love this one so cute! Great progress on both pieces. Both the German Garden and your sampler are beautiful. You have made great progress. You are so good to have almost completed the birth sampler. I still haven’t started my daughter’s and she is nearly 18 months old. Your WIP are looking great. Can’t wait to see them all finished! The German Garden is beautiful, and I love the birth sampler – all the little animals are so cute! Congratulations to Cooper! And, wow, what a treat to see your German Garden. I feel a little guilty that I haven’t opened my box since CATS! And the baby sampler… if I were still eligible to get pregnant, I think I would consider it just to be able to stitch it too! LOL! I don’t think I have ever said hello before. Lovely projects. The birth sampler will be so pretty! Wow, your WIPs are beautiful! I am curious as to the name/designer of th birth sampler? Both WIP’s are lovely, but I especially like the German Garden. Great progress on both pieces. Baby Garden is so pretty in person – you will be so happy with it!